God himself has designed the most romantic evening lingerie to be adorned by Mother Nature to show off her beauty every single night. I call it black lace, and it is a must for every bride to indulge in. Black lace is spectacular set against the soft, almost transparent glow of a midnight blue sky, especially if illuminated with a full moon above. My own favorite however, is black lace back-lighted by the neon red, orange or purple of a brilliant sunset. It is simply stunning with the contrast of light and dark. The black lace is the intricate design created by a tree line at the top of a hill or mountain ridge, thin enough to see through the tree line. Because it is the top of the ridgeline, it is not a dense forest of trees that hides the light, but instead, it is a very sheer veil created by a single, ridge top row of trees where the leaves and branches create the intricate black lace patterns open enough to see the sky behind the trees. The more “scantily clad” the lace patterns create, the more allure it seems to have. It seduces the viewer to see through the lace to the unadorned neon-colored sky lighted from just behind the trees. It happens only at the end of the day, when the light behind the tree line is brighter than the light in front of the trees. That is when the green and brown from the trees is silhouetted by the background light, turning those patterns to black lace, with backgrounds of brilliant color and light. By design, God has created the most brilliantly romantic mood enhancer where no aphrodisiacs are required. It is free for all mankind to watch, and it is one of the few majestic wonders that you can enjoy each night, as you watch with amazement that which God has created. 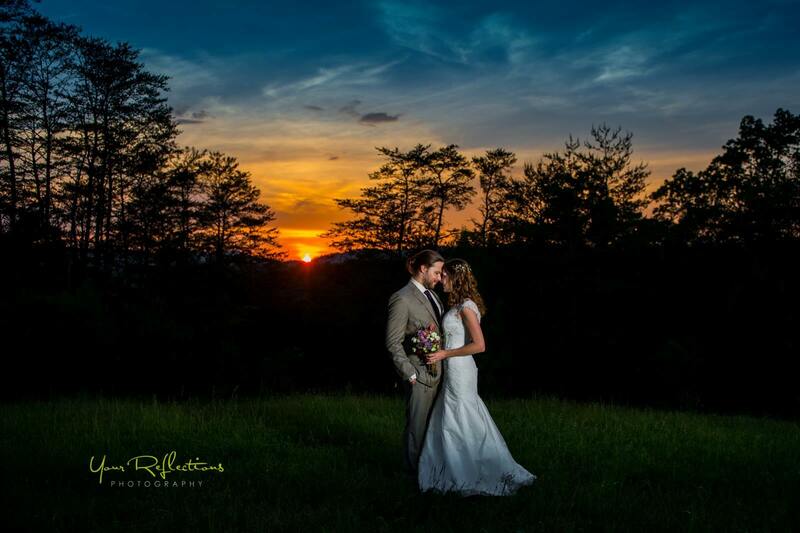 I live on 52 acres of land in the Smokies, which I share with brides and their photographers who select Country Manor Acres as their wedding venue. There are tree-top ridge lines everywhere on my property. We have named them intriguing names like “Sunset Ridge”, “Promise Point”, “Farm View Ridge”, “Reid’s Landing”, “Diablo’s Paradise” and “The Veranda” to showcase them to our stream of bridal customers as we traverse the land. I always point out these dramatic sites that the couple’s photographer can use to capture their own romantic view of the black lace at sunset with the couple centered in the lacy panaroma, their own silhouette becoming part of the black lace pattern at sunset for a most romantic picture as a highlight in their own wedding album. These ridge line black lace scenes have become as sought after as the mountains themselves for the captivating photos to be included in a couple’s engagement photos or their wedding album, to record the most romantic day as the couple begins their life-long journey together. 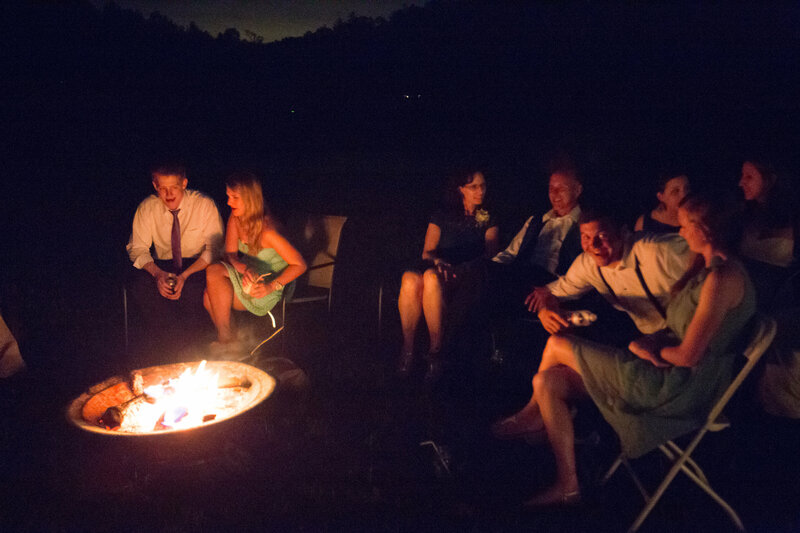 This album cover picture was taken by Your Reflections Photography at Promise Point, for Sarah and Brent’s May wedding. I get to enjoy this imagery each and every single day, perched from my own porch swing or from any number of sites I enjoy while mowing or showing off my property and God’s beauty to my wedding guests. Regardless of the hue or density of the light, or if there are storm clouds, sunsets, rain, snow or ice, the striking beauty changes each day and every minute. I often try to capture a particular night as the best ever, but then I am surprised the next night by yet a new scene created, better than the last, which leaves me with an endless anticipation of the most romantic allure.